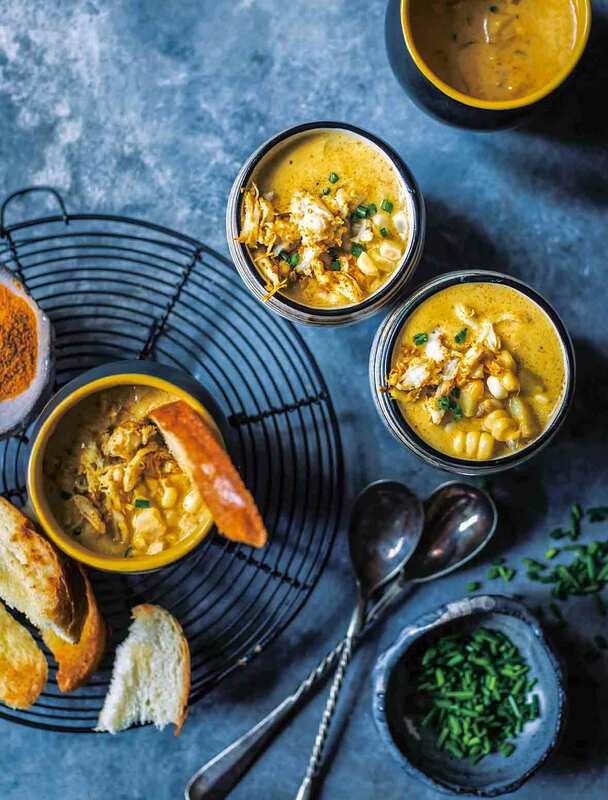 This Indian-inspired curried crab corn chowder simmers sweet crab, corn, and potatoes in a rich curry-coconut broth that’s amped up with Old Bay seasoning. 1. In a large pot set over medium heat, warm the oil and butter. Let the butter melt, then add the bay leaf and let it sizzle until fragrant, 30 to 60 seconds. Toss in the celery and onion and cook, stirring continuously, until softened, 2 to 4 minutes. Add the garlic and salt and sauté for 2 minutes longer. 2. Stir in the potatoes and cook, stirring, for 1 minute. Then add the pepper, curry powder, and Old Bay, if using, and cook over medium heat to take some of the rawness out of the curry powder, about 1 minute. Stir in the flour and cook, stirring, for 2 to 3 minutes. 3. Pour in the broth and stir to thoroughly combine everything. Then add the coconut milk and milk. Keep stirring and bring to a boil and then reduce the heat to medium, add the corn and crab and simmer until the potatoes are tender, 8 to 12 minutes. Stir in the fennel powder and adjust the seasoning to taste. Remove and discard the bay leaf. This curried crab corn chowder was delightfully rich and luxurious with the addition of crab but didn't feel overwhelmingly heavy due to the lower fat milk and coconut milk. Leftovers were even better the next day. I used light coconut milk and 1% milk. I also used the Old Bay. With a loaf of crusty bread on the side, it was a perfect meal for a very cold winter night. This curried crab corn chowder is rich and satisfying and all of the flavor components are perfectly balanced. I went all out and bought a can of jumbo lump crab meat for this recipe. It was well worth it. This curried crab corn chowder served 6 anxiously awaiting people! 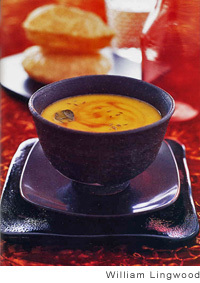 The flavors were delicious combined with the coconut milk and curry powder. I splashed 2 tablespoons dry sherry into the chowder before topping with the chives and cilantro. It seemed everything was the same color in the bowl but the chives and cilantro added that green touch at the last. This curried crab corn chowder was a hit for my husband and I. Simple enough to whip up on a weekday and filling to be a main dish with a salad. Great flavors coming through from the crab, curry, and coconut milk mixture. 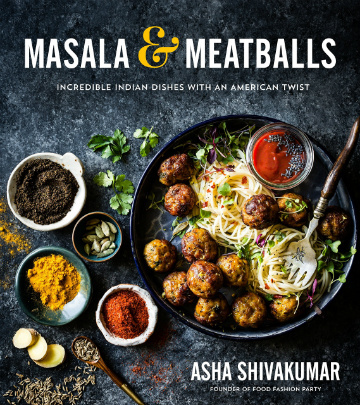 Always lovely to find ways to find recipes that make us feel like we're eating something exotic without the struggle of difficult techniques or locating rare ingredients. A flavorful twist on a seafood chowder. It appealed to all ages of tastebuds in my house, in particular my 10 year old, who liked the seasonings and gave it an 8.25 rating. My husband is usually a non-seafood eater but still enjoyed the mellow taste of the crab. This chowder was easy to pull together on a Sunday afternoon, minimal time and effort required and ready to serve with hearty bread and butter for a delicious linner (lunch and dinner) in just over an hour. Curried Crab Corn Chowder Recipe © 2018 Asha Shivakumar. Photo © 2018 Alanna Taylor-Tobin. All rights reserved. All recipes and photos used with permission of the publisher.